The title of this artwork is Crew. It was created by Quan Pham Tung working out of Vietnam, and was posted on the site artstation sometime in 2014. The image is of community of people, standing shoulder to shoulder in the foreground. standing tall Behind them is a machine, and Off to the side a bird is soaring upwards. The background of the image is dominated by the clear and bare sky, that descend into the equally featureless earth. There are two primary figures in the image and the first is the community of people who stand in the foreground. There are a few animals that appear alongside the people - to the left of the image you can see one person handling a few of the white dogs - but for the most part the foreground features a variety of people in various shapes sizes. Some are tall and thin, others are short, and other still are rotund. Some of them are wearing overalls and others are wearing helmeted jumpsuits, and others are wearing stockings. Most of the people are standing in the foreground shoulder to shoulder with one another, almost like they’re lined up for a picture. But some people are working on the giant mech behind them. To the left a few people are clinging to the the machine with ropes while on the right others are standing on top of scaffold. The second primary figure is the mech itself, towering above the people in the foreground. The shape of it is like a round hull, with cannons equipped to either side, sitting on top of a pair of inverted legs. Throughout the mech a variety of symbols have been painted. A few are recognizable like the number 5 and two little skulls. But others are more abstract, like the V shape and M shape, and a symbol that looks a little like a poke ball on the right side of the machine. There is also another minor figure, which is the bird ascending in the left side of the picture. It’s no quite apart of the group of people below and it’s also not a part of the mech, so it has some significance in its own right. A crew of individuals becomes powerful but they also gain something greater. That is partly the message of this piece. A community of individuals (as shown in their unique designs) combine their efforts to create something that transcends all of them, but also is imbued with the spirit of each of them. 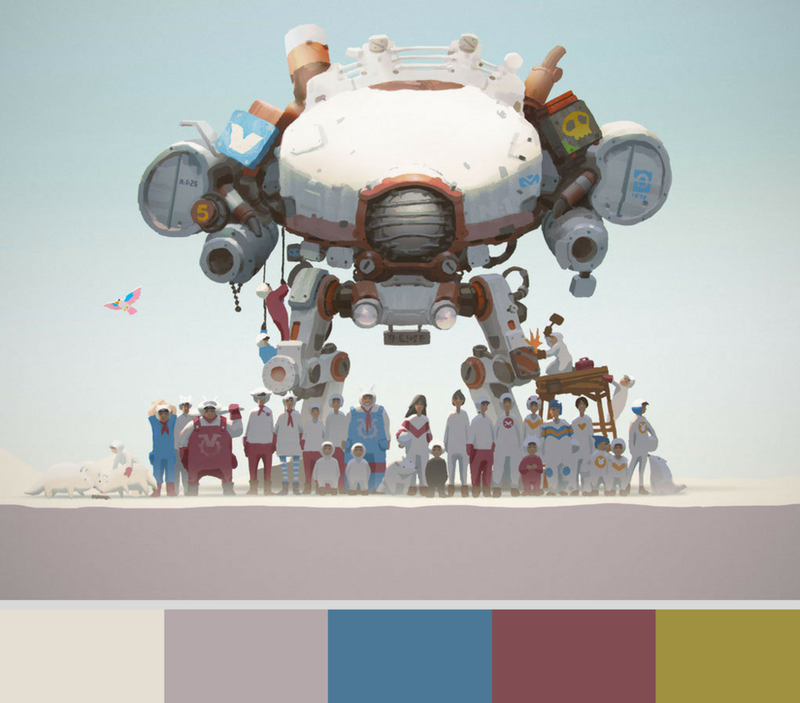 That’s the mech that stand above them but carries everyone's individual colors and symbols. But there’s also the bird that carries each color. It’s not huge, but it’s the one thing in the picture that’s flying. Where as the mech is what we could create if we combined or intellectual and mechanical efforts, the bird could be an analog for the spirit of a community in harmony. If you try to build a better future with your crew then you become powerful but you also become graceful.